Ramon Morla blasted his 8th Jackson home run on Thursday. 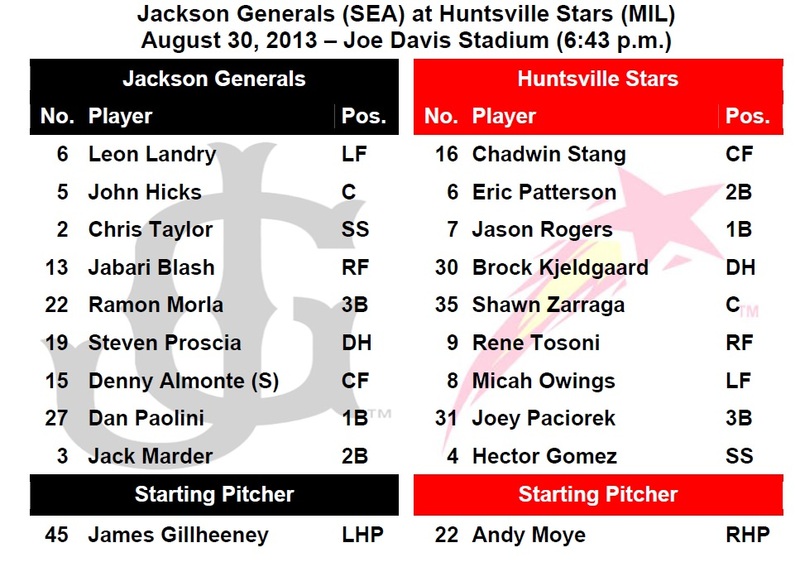 GENERALS RECAP: The Generals scored 4 runs combined between the 4th-6th innings as Jackson camefrom- behind to defeat Huntsville 5-3 on Thursday night. SS Chris Taylor (2×4, 2B, BB, SB), 3B Ramon Morla (2×4, R, HR, RBI) and LF Leon Landry (2×4, R, 2B, RBI) each recorded 2 of the Generals 8 hits. Starter Anthony Vasquez (7.0,7,3,2,1,1,2HR) recorded his 2nd win of the season, allowing 3 runs (2 ER) on 7 hits over 7.0 innings. RH Stephen Kohlscheen (1.0,0,0,0,0,2) stuck out 2 in a scoreless 8th inning, while RH Carson Smith (1.0,0,0,0,0,2) struck out 2 in a 1-2-3 9th inning to earn his 15th save. NEWS & NOTES: 47 of 131 games have been 1-run games (20-27) which is the T-1st in the Southern League…67 of 131 games have been decided by 2-or-fewer runs (26-41) and 17 have been extra-inning games (5-12)…In games decided by 3+ runs the Generals are 32-27. • BLASH HITTING: OF Jabari Blash has hit safely 10 of his last 11 games, batting .400 (14×35) with 6 runs scored, 2 doubles, 1 home run, 10 RBI and 15 walks. • TAYLOR’S HOT AUGUST CONTINUES: INF Chris Taylor is batting .342 (38×111) with 21 runs scored, 5 doubles, 1 triple, 7 RBI, 14 walks and 9 stolen bases in 29 games in August.